Sef1268 - really great site. I love that you have a Petfinder search window at the bottom of the page, all ready to search for rescue piggies! Could you add Guinea Lynx and Cavy Spirit to your links page? I also love the ribbon. A must for education and adoption events! Wow! You have everything! The next time I need a curved-tip syringe or a butterfly hookup, I know where to go. Really nice job. Thanks. I had coroplast available, too, but trying to ship it without charging an arm and a leg (and without damaging the sheet) is proving too much of a challenge. Anything that I may have missed, do let me know. I'm working on Baxa syringes and bottle adapters now. I LOVE LOVE my ribbons/magnets. I got two on the car and one on my refrigerator-it is eventually going to go to a friend of mine to display on her car. You should really think about selling clothes and stuff with guinea pig captions on it. Done! I ordered a couple of the t-shirts myself and am interested to see what they're like and how the sizes run. My husband was thrilled that I could get his in a 5XL! Sef - not sure how feasible this will be but I've seen the large packing boxes for large mirrors and paintings at wal-mart before, perhaps this will be a option. They go up to 12 feet long and 4 feet wide that I've seen. By the looks of them, if the coroplast was rolled lenthwise (with grain) the box could probably be cut in half for two shipments. Or at least two boxes and three shipments for sure. They were about $3.50 each here. Love that 'Warning, with an attitude'! Fantastic! With all the meds I give daily, I'm hooked on that combo. I had to phone Baxa and order them directly, but it will be much easier to do it online. Thanks; I'll look into the boxes. I have been all over the internet, looking for boxes and mailers. I haven't seen anything like you describe. Wonder if Staples carries anything like that? I'd rather not shop at Wal-Mart. On the Rollin the Hay, a member posted awhile back that a baby guinea pig got stuck inside the ball. I own the ball (have had it for quite some time), and most of our guinea pigs have played with it at one time or another. From my own experience the item seems safe for adult pigs, but I did post a note on the product that it's probably not suitable for younger pigs. If anyone has any other experiences with it, please do let me know. I don't want to list anything questionable. Mum-- yikes, you bought from Baxa directly? They charge a $10 processing fee for orders under $100, don't they? What sizes of their syringes do you use the most? 1ml? Yes, I use exclusively the 1cc syringes for meds. They didn't charge me the $10 processing fee because of the rescue. I adore those syringes - and they last a lot longer than most because of the rubber o-ring, rather than that big bit that comes off in pigs mouths. This is wonderful - no more rubber plungers to go down pigs' throats. I usually do 5 at a time, because I use 5 on a pig that doesn't want to eat. Than I refill them as many times as needed. I don't use the baxa syringes for this - the plastic is harder. You could include one of those with your kit, perhaps? Hey, sef1268, check out www.uline.com . KM gets boxes there and I had to order boxes for mailing out the books because they didn't fit in any I had. Understand the wal-mart thing, I wish some of the others stores weren't so far in the city or I'd have no need to go there really. If Staples or any of the other office supplies did, even craft stores, try looking in the paint and drawing isles to for large painting type boxes. Perhaps one of the places could order some for you, the box brand was Duck if that helps. Lynx, thanks. Uline is where I ordered the tall boxes I had planned to use. The original idea was to fold the coroplast accordian-style, but the stuff is just too darned unwieldy if you don't have the proper tools and halfway good hand-eye coordination. And the pads are out, too. Uline (and most other companies I looked into) charges $60 shipping! This seems to be the norm whether I order 10 or 50, as they use a trucking company to transport it due to the size. Somehow I missed this thread the first time around, but I'd like to say what a nifty site it is! Get out the dremel sander - smooth it off"
If you can do this, I WILL BUY. And more than one, too. Excellent, excellent idea if you have the time to make them. Talishan, it takes just a few minutes to do. I got so frustrated at my old method - and I almost lost the rubber plunger in a pig's mouth more than once - that I had to find a new way to do it. Can you post a picture of what one looks like that has been Dremeled? 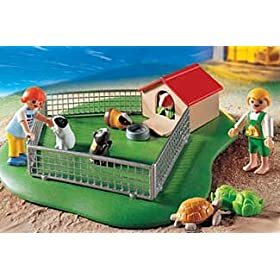 Someone asked me about the toy guinea pig set. I have been watching for it to show up again, and just added it this evening -- here. Mum, excellent, excellent photos and instruction. Can these be placed in a reference post somewhere? Sef, if you can do this I'd still buy a few, and I bet others would too. I'm fairly handy with tools, but I'm not sure we have a set like this -- or if we do, it's somewhere in the darkest reaches of the basement, where nothing with fewer than eight legs resides.